While 1Q18 ended with equity markets essentially flat, there was plenty of significant movement, as the sudden reappearance of increased volatility created a number of wild days—41 featured triple-digit moves up or down in the Dow compared to 58 during all of 2017. Additionally, the Russell 2000 moved 1% or more in 33% of its trading days during the quarter compared to 18% in all of 2017. Much of the volatility was driven by tariff and trade war talk between the U.S. and China, which sent global shares prices plummeting (and bonds rising) during March. The possibility that major players in social media might soon be facing greater regulation also shook investors’ confidence. From our perspective as small-cap specialists, the return of volatility is another component of the normalizing environment that’s been slowly developing over the last couple of years—as well as a force that’s created plenty of buying opportunities for us in the small-cap space. We also think that investors should recognize that volatility is usually part of the daily reality of equity investing—and 1Q18 certainly offered a powerful reminder of that reality, as the bar graph shows. 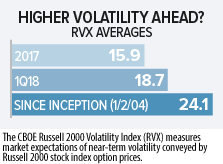 While 1Q18 may have felt like a wild ride, volatility for small-caps was actually lower than its average since the 2004 inception of the volatility index for the Russell 2000. In another departure from 2017, small-caps slightly outpaced their large-caps counterparts in 1Q18, with the Russell 2000 Index showing a 0.1% loss versus a decline of 0.7% for the Russell 1000 Index. This was a pleasant anomaly, even over a brief time span, in that small-caps are often hit harder during violent pullbacks. Yet small-caps survived the otherwise bearish and highly volatile month with a 1.3% gain while large-caps declined 2.3%. Another interesting (and related) development was the relative strength of micro-cap stocks in a bearish quarter. In 1Q18, the Russell Microcap Index advanced 0.7%, beating both the small- and large-cap indexes. Results were also helped by a particularly strong showing in March, when the micro-cap index rose 1.5%. Consistent with our observation that small-cap returns were likely to be positive but lower beyond 2017, 1Q18 was the second consecutive quarter in which the Russell 2000’s return was lower than it was the previous quarter. As pleased as we were to see a slight edge for small-cap in 1Q18, there was another, far less pleasant oddity. The style return pattern small-caps established early in 2017 (and for much of the last several years except for 2016) held firm in the first quarter. The Russell 2000 Value Index fell 2.6% versus a gain of 2.3% for the Russell 2000 Growth Index. As has often been the case historically when growth leads, small-cap performance in 1Q18 was distinguished by narrow market leadership, mostly from more growth-oriented stocks in tech and healthcare. The lack of breadth can best be seen by comparing the equal-weighted quarterly return for the Russell 2000, which was -2.5%, with its cap-weighted decrease of 0.1%. The resilience of growth stocks, which also held for micro- and mid-cap stocks in 1Q18, remains an ongoing source of puzzlement in the face of both rising rates and a growing economy. In this same context, small-cap sector results were also somewhat perplexing. Two sectors dominated 1Q18 results—Information Technology, which led all of the Russell 2000’s sectors, and Health Care, the leader in 2017. Tech saw leadership from software and Internet software & services stocks while Health Care saw robust results from health care providers & services and pharmaceuticals, each sector drawing a large share of it absolute and relative strength from more growth-oriented industries. The other nine sectors within small-cap mostly disappointed, with the more interest-rate sensitive Real Estate sector joining Energy as the two worst performers for the quarter in the Russell 2000. 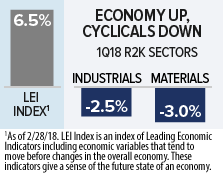 Industrials and Materials are two of the cyclical sectors that one would expect to do well during an economic expansion. And for much of the recovery they have. While outpaced by Health Care in 2017, their respective returns within the Russell 2000 were quite strong last year. Based on the ongoing pace of economic growth, we expected the trend of positive results to continue into 2018. And while the looming likelihood of tariffs undoubtedly had an effect, we were nonetheless surprised by each sector’s negative returns for the quarter in the face of healthy expansion. In addition, the ISM (the Institute for Supply Management) announced on 3/1/18 that “Economic activity in the manufacturing sector expanded in February, and the overall economy grew for the 106th consecutive month.” Similar data points have also come from other developed nations so far this year. So while quarterly results for these key cyclical sectors were disappointing, we continue to see considerable potential for our holdings in these areas as the pace of global growth continues to pick up and cyclicals resume their historical role as market leaders in times of expansion. With all of the sturm und drang impacting stocks in 1Q18, investors are likely wondering exactly how increased volatility will affect equity returns. Our take as experienced small-cap specialists with a consistently long-term investment horizon is to tune out the noise—and 1Q18 was louder than most—and focus on fundamentals. In fact, overlooked amidst all of this anxiety is the improved valuation of small-caps versus large-caps. 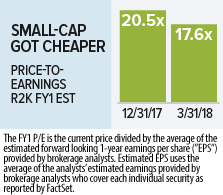 Based on both EV/EBIT (a metric used by many Royce PMs) and forward P/E’s (a favorite valuation metric for many industry analysts), small-cap stocks looked cheaper than they did at the end of 2017. Macro concerns are always with us. Sometimes they materialize to challenge the economy and markets; often they don’t. And as one of our portfolio managers recently pointed out, volatility is not a negative concept for us—it’s not a synonym for risk, but it is one for opportunity. We see short-term volatility as the potential opportunity to build or initiate positions at better, that is, lower, prices—which is how we spent much of our time in 1Q18. For more than a year, we have been making the case for select small-cap cyclicals with global exposure. As was the case in 2017, 1Q18 saw better results from small-caps with greater global exposure as companies in the Russell 2000 that have no foreign sales were down 1.5% while those with foreign sales of 30% or higher rose 1.7% (ahead of the index’s 0.1% gain in 1Q18). In the context of anxieties on one side—tariff and trade trouble, inflation, rising rates, and increased regulation—and tangible positive news on the other—an accelerating global economy and improving small-cap earnings picture—we are choosing optimism, however cautious. 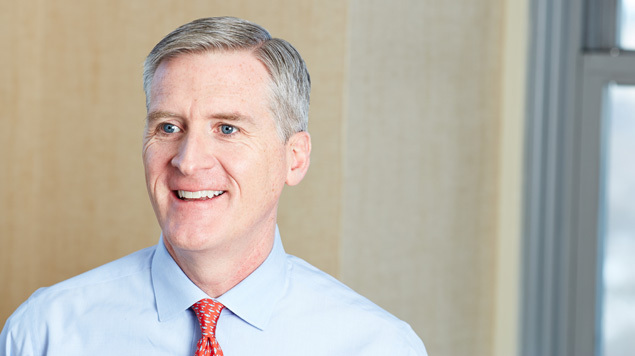 We’re expecting lower overall returns for stocks and think that leadership will come from small-caps in economically sensitive industries that blend profitability, relatively attractive valuation, and global exposure. All indexes referenced are unmanaged and capitalization-weighted. Frank Russell Company (“Russell”) is the source and owner of the trademarks, service marks and copyrights related to the Russell Indexes. Russell® is a trademark of Frank Russell Company. Neither Russell nor its licensors accept any liability for any errors or omissions in the Russell Indexes and / or Russell ratings or underlying data and no party may rely on any Russell Indexes and / or Russell ratings and / or underlying data contained in this communication. No further distribution of Russell Data is permitted without Russell’s express written consent. Russell does not promote, sponsor or endorse the content of this communication. The Russell 2000 Index is an index of domestic small-cap stocks that measures the performance of the 2,000 smallest publicly traded U.S. companies in the Russell 3000 Index. The Russell 2000 Value and Growth indexes consist of the respective value and growth stocks within the Russell 2000 as determined by Russell Investments. The Russell 1000 index is an index of domestic large-cap stocks. It measures the performance of the 1,000 largest publicly traded U.S. companies in the Russell 3000 index. The Russell 1000 index is an index of domestic large-cap stocks. It measures the performance of the 1,000 largest publicly traded U.S. companies in the Russell 3000 index. The Russell Global ex-U.S. Small Cap Index is an index of global small-cap stocks, excluding the United States.The performance of an index does not represent exactly any particular investment, as you cannot invest directly in an index.